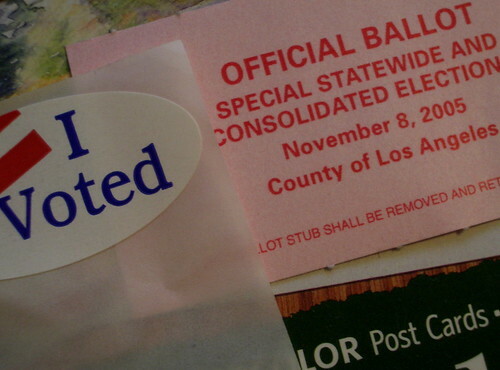 Next month Californians will elect the next governor. It’s not a good time to take the helm. As of October 1, we still didn’t have a budget for the current fiscal year as politicians battle over how to resolve a $20 billion (yes billion) deficit. Despite the dire economic status two candidates are battling it out for the privilege of trying to fix the problem. I’m not excited about either of them. We have the billionaire businesswoman who is trying to buy the role and the career politician who’s been there, done that. Yes, there are minor party candidates but they have no chance of winning. Without even getting to platforms and their positions on the issues, there are several reasons to be disappointed in our options this year. The constant television commercials this year are reason enough to not vote for Meg Whitman. But I can give you a few more reasons she doesn’t make me happy. Inexperienced. We tried it with Arnold Schwarzenegger and we all know how that worked out. Leading in the private sector does not equate to governing. Bully concerns. Meg has admitted to pushing a subordinate and her money got her out of trouble. My impression is that she’s a “my way or the highway” type of person. How could she bring together this state’s fractious legislature? Voting Record. Maybe someone could overlook her lack of political experience but Meg was so unengaged she did not vote for 28 years. I think that’s a civic duty for anyone but especially someone who wants to lead our state. It’s been 27 years since Jerry held the governor’s office and for some reason he wants to give it another go. He never really went away having held various positions including his current role as the California Attorney General. Here are three reasons I’m not excited about recycling this candidate. Age. If elected, Jerry will be the oldest California governor in history. How much energy and focus can he have and for how many years? Lackluster Campaign. This candidate almost seemed as if he didn’t want the job but was drafted anyway. The campaign got a very late start this summer while Meg was running tons of commercials. Experience. His last go-round, Jerry earned the nickname of “Governor Moonbeam” which hasn’t been forgotten. I think experience is a good thing, but maybe this candidate has too much. There isn’t another qualified Democrat in all of California? When my ballot arrives in the mail soon I’ll have to pick one of these two. I already know which one will win my vote but it won’t be made with excitement. I’m sorry that there isn’t another choice. there are minor party candidates but they have no chance of winning. I would give some thought to voting for one of these minor party candidates if one of them has appeal to you, Kay. It’s true that they have no chance this year. But if all the people who are not happy with the choices put forward by the two major parties made clear their unhappiness by voting for other candidates, that would in time change. The two parties don’t have much incentive to do better so long as they are the only game in town (and they work hard making sure that they remain the only game in town — a lot harder than they do trying to solve the problems of the people they supposedly represent). Rob, I think you make an excellent point. It’s just that the minor party candidates do not get any media attention and have virtually no advertising budgets. I feel like a vote for one of them is throwing it away. I think your state’s budget deficit is bigger than the budget for my whole state. That is absolutely incredible! Jeff, it’s a big money state here but 37 million residents require a lot of services. Interesting… I am glad I have another choice where I live. In fact reading your post I felt like I would not be even voting (not that approve not voting) in California. Good Luck to you with your decisions. As I mentioned we do have small party candidates, but I just feel voting for one of them is wasting my vote. Good analysis. I have just started paying attention to that race. I will be interested to see who wins. Both candidates appear to be flawed. I guess that most candidates for any office have flaws; that’s part of being human. I just wish one of them excited me like I felt during the 2010 election. The politics of your state have always been slightly interesting to me. Of course, I come from Illinois, where politics is like a heavyweight sport, so it’s the perceived contrast that’s always been interesting. I have close family there (Northern California), so I’ll have to ask them their thoughts. By the way, didn’t Jerry Brown make an attempt to run for President some years back? Yes, Jerry Brown did run for president…3 times! I guess he’s not a good fit outside our quirky state. I would say Illinois politics is pretty interesting as well. I wouldn’t be surprised if he tried to run again in another 4 years! Kay, thanks for this and helping show some new points! Who you gonna vote for??!! Meg seems kinda scary, and perhaps Brown can do better 2nd time around? I like how he’s saying no new taxes without voter approval! You’re going to make me put it out there, huh? I’ll be filling out my ballot this week and my choice is Brown.